I forgot the academy awards were last night (not having a TV will do that to you), and just found out that our President the man who got the majority of the population to vote for him in 2000 but wasn’t actually elected because of our fucked up election system, some corrupt officials, and a conservative Supreme Court, won Best Documentary Feature, and Melissa Etheridge won Best Original Song for her piece in it! 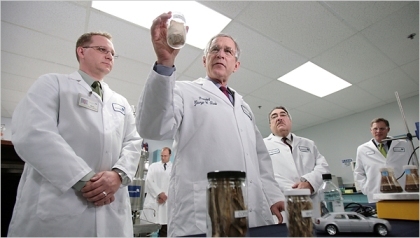 In related news, some drunk from Texas President Bush got his picture taken with some scientists, what appears to be pickled eels, and a toy car. Because he’s so serious about alternative fuels. Note that he’s the only one wearing lab goggles. Bill Nye he ain’t.